So I was talking to my friend and they asked me what are some of the things that I would like to do when I finally have a family of my own. Like what values and activities would I bring back to make my family a close unit that makes them feel loved and open enough to come to me when they have problems. I'll admit that I've never really thought about that before and I started to think on what things I could do to be the best leader of my household I can be. When thinking about these things I wanted to remain practical but at the same time I wanted to bring back things that are kind of lost in the way of the world due to everything being so fast paced and everyone always being on the go. Slowing down life and appreciating my family is the one thing that I want to do, so I came up with some things that I think that could work in this day and age, while promoting growth and a loving environment. 1. Prayer | This is the big thing and the first thing that I came up with on this list. We have to put God first and foremost because He's going to be the one protecting our family. Church will be a thing if I can help it. I mean I know that it won't be one of those deals where we participate heavy in the church and do every single thing they offer, because that's not my thing. But I know that at the very least, every Sunday that we can attend, we will be there. Without God then there won't be any kind of peace to my family and I'm going to teach my children how important it is to keep him first and to keep him centered. 2. Involvement | For the parent that is always around, there is a certain amount of respect given to a child. Like if a dad shows up to the parent teacher conferences, the football games, holiday stuff, school activities, people tend to look at that child as a reflection of the parent's effort. Seeing how much a parent is around and taking a genuine interest beyond a child's report card is important. You can't just say "hey go make good grades" and expect great things. You have to be there for all of the other things that matter in their lives. Children don't live and die off grades, they need you to be there for the more important things in their lives, and I plan on doing just that. 3. Bedtime Stories | This may seem like a trivial thing to some, but talking to your children right before bed is a big thing. Them knowing that you love them enough to come in and tuck them into bed every night when they are little is important because it lets them know that they are the first thing on your mind in the morning and the last thing on your mind at night, even though we know this not to be true in our later years lol. Either way, talking to your kids every single night before they sleep will let them know that you don't want them going to sleep with a lot on their mind and that your the perfect person to take in all of their cute little burdens. 4. Family Night | Family time together will always be big, but actually doing stuff on the weekends will not always be possible because of other things going on. By having a family night during the week where you guys get together, have a special meal and then watching a movie or playing a game is a great stress reliever for all and a good time to have family conversations about what's going on in the household. This is the time where one gets to engage and measure what's going on in your child's mind through a relaxed environment instead of drilling them with questions. Their mental and emotional stability are the two biggest things outside of their spiritual stability. So making sure that is all good through family bonding moments like Family night is essential to their and your growth as a unit. 5. Eating Together | Breakfast and dinner will be things in my household. I know that breakfast will be bit of a stretch because morning routines dictate how you get out of the house, but dinner will never be a question. I know in today's day and age people tend to want everything fast paced and in timely manner, but with my family I plan to slow it all the way down so that they know it's real. Dinner should be a time where you talk about your day and reflect on things that could have been done better and to give advice to everyone at the table and not just the person with the problem. Plus you get to have cool meal nights! 6. Family Traditions | Every family has their thing that they can call their claim to fame, it's up to your family to naturally come up with your claim to fame. This is one of those things that I'm looking forward to because it's what gives a family an identity, and depending on what it is, we all get to be dorks lol. This is the time you get to show your kids your creativity and that you're just not a parent who rule with an iron fist lol. 7. Being Active Together | There's something to be said about the family that actually goes out and does things together. I'm not your typical black dude and I plan on doing things like camping and hiking with my family. I mean there's so much you can do in the outdoors, you just have to go out and do it. I mean you can't just sit around the house eating chips and stuff and think that's a good time. Get your family up and show them the world, there's more than just what's in your front yard. 8. Positivity & Encouragement | I think one of the things that's missed is the fact that parents don't support what their kids are doing anymore, essentially not letting them be kids anymore. I'm a man and one of my fears in life is that my son will grow up to be gay, I mean I'm not going to sugar coat that at all, but if he ever decides that he wants to be gay then I'm going to support him because that's what good fathers do. He's going to hear my mouth about it, but at the end of the day I'm going to support him, give him the good and the bad and let him ultimately make the decisions. In this day and age everyone wants you to be something that they want. Allowing your kids to fail and succeed based off their own merits will build character, and I plan on letting them learn the hard way so they can succeed in the end. 9. Appreciation | Express your sincere appreciation for loved ones every chance you get. Whether it be through hugging, talking to them constantly when they need it, or just saying that you appreciate them, it's important that you show it and teach them how to show it and in turn they will in their own way. When dealing with small children you have to remember that they are people trying to find their way in this world, so appreciation for them is very important. Saying little things like I love you or I wouldn't know what I would do without you guys goes a long way. That gives the basis to let them know that you not only love them but you appreciate the overall value that they bring to your everyday life. I mean who wouldn't want to know that they enhance someone they care about and admire? 10. Love | This maybe the most obvious one but it's the most neglected one. A lot of people love but most don't know how to properly show it at times. It's a hard thing to do and it's no simple formula to answer how to do it. I mean it's based off your family and how they operate. Like for instance, I never tell my mom I love her but that's because she's not big on that stuff, does that mean she loves me any less? Of course not, that's just how we operate and how we do things in OUR family. And sometimes other people need to hear it constantly, and there's nothing wrong with that at all. Just know that everyone in your family deserves the most unconditional love on this planet, and it takes effort to do that, but I'm confident that I can and so will you too. Those are my family values that I hope to live by when I finally have my family of my own. Just because these are mine doesn't mean that these have to be yours. Like I always say, you have to know YOUR loved ones because no one else will have to live and deal with them daily but YOU. So take the time out and find out what you want to do with your family, nothing wrong with having some kind of idea and then tweaking it as you go along in life. 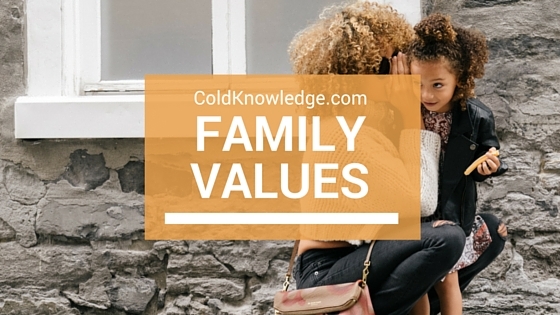 What are some of the family values that you want to have when you finally have a family? Leave it in the comments below.